With a Nobel Prize in the subject, you’d expect The New York Times’ Paul Krugman to know his stuff when it comes to economics. (Though, of course, after Barack Obama received a Nobel Prize for the mere “hope” he’d do something meaningful, it definitely took some of the luster off the honor.) 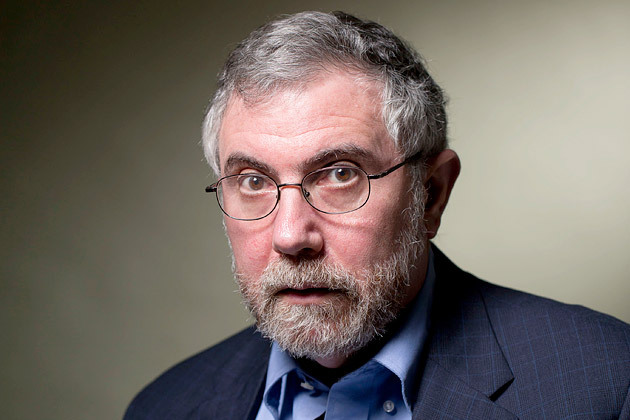 Unfortunately, Krugman’s extreme partisanship too often colors his rational thinking. For example, the man believes that the media was biased against Hillary, not Trump, for crying out loud. One could walk through a number of predictions Krugman’s gotten dead wrong in the past, but his gaffes are the funniest when proven wrong immediately… like on election night. While the stock market officially closes at 4PM EST, in the middle of the night as election returns rolled in, the futures market was alive and hectic. The Dow Jones Industrial Average was down an astounding 800 points when a Trump presidency started looking certain. It was a decline in the market from which we may never recover, predicted Krugman that night. If by “never” Krugman meant within the next eight hours, he would’ve been right. By the time the markets opened, all the major indices recovered nearly all their overnight losses, and as we reported yesterday, the Dow Jones closed just a fraction of a percent off its all-time high. Since then, as the Gateway Pundit’s Jim Hoft notes, out of 23 days since the election, the Dow has reached all time closing highs 15 of these days! On another five of these days the Dow landed at its second highest close ever up to that date! Of course, this doesn’t prove anything about what Trump’s presidency will be like, and past trends don’t predict future performance, but clearly Krugman couldn’t have been any more wrong. Err Kruggers was assuming Trump would fulfill all his policies. The Stockmarker rose when it was apparent he was walking away from some of his most stupid. No mention of his next column where he mentioned this and other things. I wonder why. One would also wonder why a classical liberal would support such a left wing politician..what about his deficit blowing policies. 1) Krugman made a prediction that the stock market would possibly never recover after falling 800 points election night. 2) The next day, the Dow recovered all those losses, and closed in the green. What exactly are you contesting? you clearly left out Krugman’s next column where he said he used hyperbole ( my words) in his first reaction. you were either highly misleading, ignorant or simply lying your guts out.. I am only going on your writings. Markets react to information.not hard to discern why they changed direction. They clearly thought Trump was a politician who would brake promises. I will find it more interesting to see how the Fed reacts to his fiscal policy given where potential GDP is now. At least Reagan had quite a lot of space when he implemented his expansionary fiscal policy. It is how a portfolio performs over time not in very short time periods.